Fibonacci numbers/ratio are an integral part of technical analysis. Entire concepts and trading theories were based on them. Traders always strive to get into a trade at the right moment. What would the right moment be? In a bullish trend, they’re afraid to buy the highs. The fear of buying at the top is too big. In a bearish one, the opposite happens. So, what is the answer? Fibonacci. That is the tool that helps traders enter in a trade after a pullback. Typically, this pullback is anywhere between 38.2% and 61.8%. Depending on the strategy different entering techniques are used (scaling, etc.). But, trading a Fibonacci retracement or expansion level is something common. Is there anything else surrounding the Fibo levels? While I preach price action and am a big fan of it, here’s how Advanced Fibonacci Strategies are used in ways not known for every trader. At the end of this article, I’m sure you’ll look at the Fibonacci ratios/levels with different eyes. Traders use the Fibonacci numbers to find support and resistance. The more elements in the same place, the more difficult the level to break. Moreover, the bigger the time frame, the stronger the support/resistance is. But, those levels form horizontally. However, horizontal support and resistance levels are not always the most important ones. Although I prefer horizontal, dynamic levels work quite good, as well. As usual, they should be treated as part of a money management system. This way, everything related to risk is kept under control. But, what is a dynamic level? As mentioned above, if classic support and resistance levels form on the horizontal, a dynamic level is not. Price can meet support/resistance on a rising/falling level. That’s where dynamic comes from. Above is the EURUSD daily time frame. It shows the recent move that started this spring. The key here is to use the golden ratio (61.8%) to find dynamic support and resistance levels. Given the time frame (daily), the resulting levels are great for quick rejections and intra-day/intra-week trading opportunities. 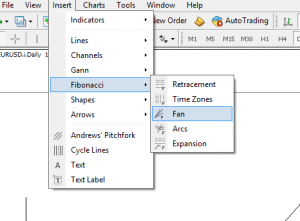 For trading resulting dynamic/support levels, the tool to use is the Fibonacci Fan. Any Metatrader platform offers it under the Fibonacci tools tab. After the bottom, wait for the market to make a new swing higher. Then, look for a pullback that doesn’t take the previous swing’s lows. Look for the price to come higher and form a new high. That’s the key to everything: from the bottom, we have a swing higher, followed by a pullback that didn’t break the lows, and then a new high comes. From this moment, we can use the Fibonacci Fan. Simply click and drag the tool from the absolute low to the end of the first swing higher. The tool has, by default, three lines: 38.2%, 50%, and 61.8%. Our main interest is the price action surrounding the 61.8% rising trend line. It gives both dynamic resistance and support for the months to come. No less than seven opportunities on the daily time frame arose from such a simple, yet powerful setup. Now, imagine the opportunities in the long-term! By using the four steps above and the Fibonacci Fan tool, endless opportunities arise. This in no way should be a reason for you to overtrade. Indeed, the less often you place a trade, the more time you will have to pick the best trades amongst trades. Also, I want to make it clear that I am not using Fibonacci tools in my trading. They are an excellent tool but I have my own trading strategy, which many amongst you have already learnt. I just like to stick to what works and not jump from one system to another. This article is for educational purposes only and maybe you can pick a few bits and pieces to help you become a better trader by learning a new concept and applying an advanced fibonacci strategy. Price and time- the holy grail in trading. Ever since technical analysis exists, traders were fascinated about the time element. The thing is that when trading, everyone’s focus is on price levels. That’s absolutely correct! But, it is not everything. What if we can have an idea about when the price will reach a specific level? What if we can incorporate time in an analysis? Again, Fibonacci comes to help. Great technical analysis concepts were derived from cycles. Such a concept is the Elliott Waves Theory. Elliott built the entire theory around Fibonacci levels and ratios. But, not only when it comes to price. Time elements were first mentioned when he divided the market in a different cycle. The cycles, or waves, have a different time component. Like it or not, Fibonacci gives an educated guess when a specific wave/cycle might end. As such, Elliott incorporated the Fibonacci levels in the rules of the most important patterns. The last couple of years resulted only in consolidation on the EURUSD chart. The daily chart above shows the hesitation surrounding the pair. But, when the market consolidates, a very probable way to do that is through a triangle. All we needed to imagine was a first swing higher. Or, the a-wave. The idea is to measure the time taken for the first leg of the triangle. 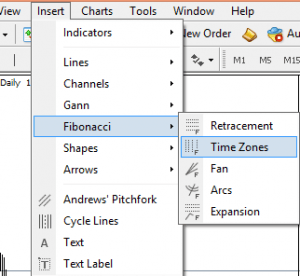 Simply click and drag the Fibonacci Time Zones from the start of the triangle until the end of the a-wave. The resulting 161.8% and 261.8% moments in time give an educated guess about WHEN the b and c waves end. Let’s just say you just don’t want to be short, or long, but know when the time for the two waves “expires”! The examples in this article are only to show how Fibonacci levels can be used differently. It’s not all about retracement and expansion. As you can see, there are more ways to use these wonderful ratios. Moreover, with access to technology, traders find different ways to use charts. Faster too. I wouldn’t be surprised to see, in the years to come, different types of Fibonacci analysis incorporated in the technical analysis. But, above all, if there’s one trading theory that incorporates Fibonacci strategies, that’s the Elliot Waves Theory. The example used here is just that: an example. The whole theory is full interpreting waves/cycles based on either price or time with Fibonacci numbers/levels/ratios. The aim of this article is to open your eyes to the many possibilities to use the Fibonacci tools and levels. And now, I dare you: pick a currency pair and a time frame and use the four steps described earlier in this article. The resulting dynamic support and resistance levels will be worth the try. From that moment, we can use the Fibonacci Time Zone. This trading tool appears on the default settings of any MetaTrader platform too.